OAKLAND — Police are investigating Sgt. Derwin Longmire’s phone calls with jailed former Your Black Muslim Bakery leader Yusuf Bey IV as well as separate allegations that Bey IV provided women to Longmire for sexual favors, a police spokesman said Friday. Longmire spoke with Bey IV at least twice last year in a three-way conversation with Bey IV’s common-law wife, who had received calls from Bey IV at Santa Rita Jail in Dublin. Bey IV was being held there on charges unrelated to the 2007 killing of journalist Chauncey Bailey. 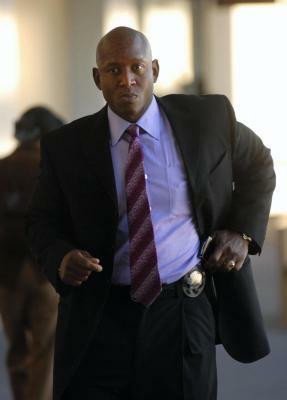 In one late night call in June 2008, Longmire told Bey IV they had always “gotten along like brothers should,” even as Longmire investigated Bailey’s killing, and that their friendship would endure. The calls were never mentioned in Longmire case notes of his investigation into Bailey’s killing — a killing Bey IV is suspected of ordering. KTVU-TV report: Taped phone conversations reveal questionable relationship between Bey and investigator. In numerous jailhouse calls obtained by The Chauncey Bailey Project, Bey IV frequently mentions Longmire, sometimes calling him “LM,” and urges his wife to call and send text messages to the sergeant. In one instance in June, the day that reporters from The Chauncey Bailey Project interviewed him in jail, Bey IV told his wife to prepare a written statement about the Bailey case, but to fax it to Longmire when it was finished. “Call LM so he can have it,” Bey IV said. When his wife referred to the sergeant as Longmire, Bey IV snapped, “I said LM for a reason. If I want to say his name, I’ll say his name.” Jail calls are automatically recorded. A retired Boston police lieutenant who now teaches criminology at Boston University said it is “unprecedented’ and “malfeasance” that a homicide investigator would be having conversations with a jailed suspect and his family. “They are looking at this guy (Bey IV) for complicity in a murder,” said Thomas Nolan. “There is clearly an association” between Bey IV and Longmire. “There is something to hide here,” Nolan said. In addition to the phone calls, Longmire also did not document evidence pointing to a conspiracy to kill Bailey, including information from a tracking device hidden on Bey IV’s car that showed him parked outside Bailey’s apartment seven hours before the Aug. 2, 2007, slaying for which one of his followers, Devaughndre Broussard, is charged. Bey IV has denied any involvement in the killing. His lawyer, Anne Beles, didn’t return a phone call Friday. Late last year, a confidential informant told investigators from the Alameda County District Attorney’s Office that Bey IV bragged in jail that Longmire was a “sympathizer” to the bakery, and Bey IV said he provided women to Longmire for sexual favors. The informant also claimed that Bey IV said he ordered Bailey killed. Rains also said Longmire was not protecting Bey IV. Oakland detectives have no requirement to “catalog their conversations,” during an investigation. Oakland police spokesman Jeffrey Thomason said the Police Internal Affairs Division and the state Justice Department — have been working together to investigate Longmire’s work on the Bailey case since last year and would probe the phone calls and statements of the confidential informant. Thomason said Oakland police are no longer investigating the Bailey case, which has been taken over by the Alameda County District Attorney’s office. A person recently interviewed in the case said a prosecuting attorney and inspectors running the investigation are “laser focused” on Bey IV’s involvement in the killing. More than 18 months after Broussard admitted to killing Bailey because he was going to “write bad things about the bakery,” he remains the only person charged in the case. Bey IV “is the one we want,” former police Chief Wayne Tucker said in January when he resigned from office, in part because of what he called unspecified “mistakes” in the Bailey investigation. She called the situation “very serious” and said she was befuddled why Longmire would have such conversations with Bey IV. Rains, Longmire’s attorney, said the detective “talks to everyone” and was under no requirement to document the fact he talked to a suspect in the Bailey case. Independent journalists Mary Fricker and Bob Butler, Oakland Tribune staff writer Kelly Rayburn and Chauncey Bailey Project intern Andrew Palma contributed to this report. Thomas Peele is an investigative reporter for the Bay Area News Group. Reach him at Tpeele@bayareanewsgroup.com. Violation of these CA. Penal Code sections are a felony and could result in a State Prison sentence. It seems shocking that the District Attorney has not filed state charges against Sgt. Longmire. Additionally, US federal code violation may also be prosecuted under a RICO filing. Please help get these charges filed in the interest of Justice. Thank you.